Can Seattle’s streetcar project be canceled if an independent review finds flaws? Millions of dollars have already been spent and Seattle has accepted $50 million in federal funding, money that would almost certainly have to be returned. As Seattle conducts a review of its plan to expand the downtown streetcar system, one obvious question presents itself: If the review shows troubling results — costs much higher or revenues much lower than estimated — is it too late to cancel the project? The answer isn’t clear, but the city has already devoted significant resources to the project over the last six years, and scrapping it would carry significant costs. Millions of dollars have already been spent and Seattle has accepted $50 million in federal funding, money that would almost certainly have to be returned, potentially damaging the city’s credibility when it seeks federal money in the future. Seattle has already signed contracts for the project worth at least $90 million, including more than $52 million to buy 10 new streetcar vehicles. Just how much of that money has already been spent, or obligated, is part of the ongoing review, which is to be completed within 90 days. The first phase of utility work for the streetcar expansion began last fall, at a cost of about $13 million. The second phase of utility work will begin soon — the contract was awarded in January — and is scheduled to be completed by July 2019, at a cost of $25 million. The city’s contract with CAF USA, the company building the new streetcar vehicles, does allow it to cancel the order, for any reason, provided it pays for work the company has already done. The bids for another contract, to repave First Avenue and lay streetcar tracks, have all come in over projections, although that contract has not yet been awarded. The $177 million project, known as the Center City Connector, has been in various states of planning since 2012. Once it is complete in 2020, a 1.2-mile streetcar line will run along First Avenue, connecting the city’s two existing but separate streetcar lines on First Hill and in South Lake Union. Seattle Department of Transportation (SDOT) officials expect ridership, which has previously failed to meet expectations, to grow exponentially. Mayor Jenny Durkan ordered an independent review on March 19 after a Seattle Times report that SDOT may have significantly underestimated the costs of running the system, brushing aside concerns from King County Metro Transit, which operates the streetcars. But even delaying the project could prove cumbersome. The city had planned to have First Avenue paved and tracks laid down by the end of this year so that cars and buses could use the roadway while the Alaskan Way Viaduct is being torn down. The city signed the contract to purchase the new streetcars last September, about two weeks before SDOT delivered a report to the City Council on the project’s finances. The City Council had requested the report as a condition of continuing the project, after expressing concerns over potential future funding shortfalls. 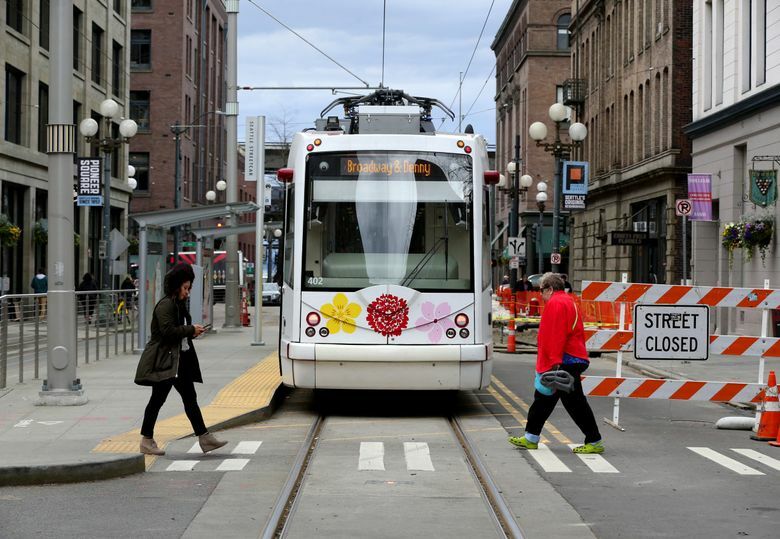 The council was unaware that SDOT had signed the streetcar contract before returning its report on the finances, Councilmember Lisa Herbold said. The city has secured $50 million in federal funding for the project and the new federal budget signed by President Donald Trump on Friday boosts the odds that the project will get another $25 million. Last October, as the City Council was weighing whether to move forward with the streetcar project, Chris Gregorich, then the city’s director of intergovernmental relations, and Leslie Pollner, a D.C. lobbyist hired by the city, wrote to Herbold, warning that withdrawing funding from the streetcar would carry serious consequences. The money, they wrote, could not be used for other city projects and would be returned to the federal government. “Withdrawing support at this point could damage the city’s credibility with the Federal Transit Administration, jeopardizing our other projects in the queue and putting future projects at risk,” they wrote. Bids for the next phase of work on the project were due earlier this month, and all came in higher than estimates. The city estimated that it would cost $47 million to $49 million to repave First Avenue, lay down streetcar track and install stations and overhead wiring — work it wants done by June 2020. The lowest bid to do that work came in at $54 million, $5 million more than the high end of the estimate.